I've been whining about my camera only taking 'fuzzies' since it was dropped. Today, I went to get a brand new one. I can take pictures again! I've been so lost without it. I'm psyched and ready to go out to shoot some pics right now! Alas but I need to wait until it's fully charged, so tomorrow will be soon enough I guess. I wanted an easy point and shoot format. I wanted compact and light weight, too, since it goes most everywhere with me. 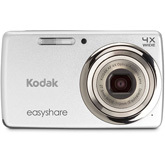 I looked at a few different brands in comparable price ranges and decided on the Kodak Easy Share M532 14 MP (megapixel) 4X wide angle zoom 28mm WIDE - 110mm (equivelant); 2.7" (6.9cm) LCD. It is compact and light weight, lighter than the other one; rechargable battery (which by the way can either be charged via ordinary outlet or thru your computer when it's running. Storage from the factory is 64mb (not a lot, so it has a space for a SD card. I already have a 2GB that will fit it, so no need to buy another one. Wish me luck! In a few days I'll have it down to a science.